This is one of the most interesting documentaries I’ve seen on bike theft. Filmed in London in 2007, the title refers to the statistic that in the UK, a bike is stolen every 60 seconds! You can watch the whole thing at the end of this post. But what’s in it? Well, loads of goof stuff. They steal their own bike several times with increasingly intrusive tools in very public places to show that no-one ever intervenes. There’s a glimpse of the Sold Secure workshop where they dispatch some cheap cable locks very quickly. And they film several sting operations by the police and set up their own sting operations so they can track the stolen bikes. Of course all the bikes in the sting operations are locked with cable locks. And all the thieves that steal the bikes are using very basic wire cutters that slice through those locks in a matter of seconds. The lesson here as always: never use a cable lock to secure your bicycle! There’s also another section which I remember caused some controversy at the time. Almax, who manufacturer high security, bolt cutter proof chains for motorcycles, attack some of the higher security bike locks with a pair of Irwin Record 42″ bolt croppers. In the video, they cut through the Abus City Chain X-Plus (10 mm links), the Kryptonite New York Fahgettaboudit Chain (14 mm links) and the Squire MC4 Chain (13 mm links). As well as a selection of unidentified u-locks. (Why didn’t they identify the u-locks?). All in a matter of seconds. As we already know: any chains with links less than 16 mm can be cropped with the best bolt cutters, the right technique and enough weight behind them. But that’s a very specific combination and the suggestion from Almax at the end of the piece that “any cyclist that buys any of these locks we’ve tested today are not safe”, irked many involved with bike security, with Kryptonite offering their own response. And you can read more of the opinions of some of the people involved in this test here and here. Irwin Record 42″ bolt croppers do cost over $400 / £300. And as you can clearly see in the video: to crop these chains they need to be close to the ground so the thief can use the floor for leverage. Lastly, have a good look at the blokes doing the cropping: they’re not exactly lightweights! So yes, some professional thieves will use these bolt croppers. And if your chain is too close to the floor and the thief is heavy enough and knows what they’re doing, you will lose your bike if it’s locked with these chains. But there’s a good few “ifs” here. If you want a bike lock that’s guaranteed to be bolt cutter proof, it needs to be at least 16 mm thick. It could be an Almax chain. It could be a Pragmasis chain. 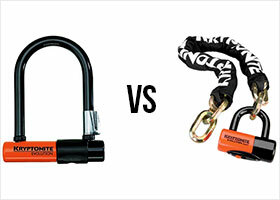 It could be an OnGuard Brute or a Kryptonite New York Standard u-lock. But not everyone with a 42″ pair of bolt cutters can cut every bike lock that’s less than 16 mm. So think about your circumstances, think about the realistic risk to your bike based on those circumstances and make your choice accordingly. In fact, I’ve written a useful guide here to help you choose the right lock for your bicycle according to your circumstances. There’s a nice bit where they go down to Brick Lane market in East London to find loads of stolen bikes openly on sale in a thieves bazaar. I used to live around there and it was notorious and completely blatant. It was quite common to see kids fighting amongst themselves as one thief came to reclaim a bike that they’d stolen but that had subsequently been stolen from them by another thief! I don’t know if it’s still going on as I haven’t lived in London for a while and the area has been massively gentrified. But if it’s not happening in Brick Lane it will only have moved somewhere else. The other thing that caught my attention watching it again today was Boris Johnson, a keen cyclist and a man who has consistently shown himself to care only for himself, complaining about our “atomistic society” and bemoaning the fact we don’t watch out for each other anymore. Prat.